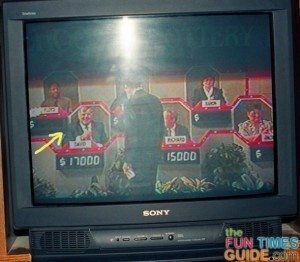 My dad was on a game show (Hoosier Millionaire). My brother was in a game show audience (The Price Is Right). Personally, I’ve always had a unique curiosity about TV game shows and how they’re run. Certain things like the Slumdog Millionaire movie, Ken Jennings’ win streak on Jeopardy, and Pat Sajak hosting Wheel of Fortune drunk tend to stir up my interest in game shows — especially the behind-the-scenes stuff. I’m an avid researcher and a collector of fun facts. 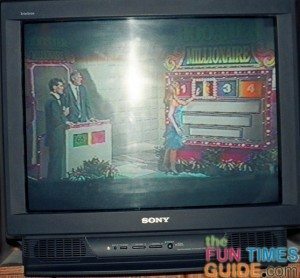 Following are some of the tidbits about TV game shows that I’ve collected throughout the years. Granted, game shows change their rules and strategies over time, but it’s still interesting to see what contestants have had to go through and hear their tips for getting on a game show and winning the big prize! 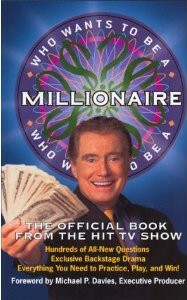 The game show Who Wants To Be A Millionaire debuted in 1998 in the UK, and in 1999 in the US. Contestants must answer 15 questions correctly in order to win 1 million dollars. The first million dollar winner did not need to use any of his lifelines. To get on the show, the audition process takes place in 2 steps: You first take a written test. If you pass that, you’re interviewed by a show representative. Make it through the interview successfully, and you’re in the contestant pool! One of the easiest ways to become a Who Wants to be a Millionaire contestant is to attend a live taping in New York City. When you arrive for the taping, you’ll have the opportunity to also audition to be on the show. Contestants are responsible for all expenses incurred in connection with their appearance on the show. You are responsible for making your own travel arrangements and paying all costs associated with your travel to New York City including transportation, hotel, meals and any other expenses you incur. Don’t get your hopes up too high. It’s estimated that 7% of the 240,000 daily participants correctly answer the 3 initial questions in the time provided. Contestants get 15 seconds to answer questions #1-5, 30 seconds to answer questions #6-10, and 45 seconds to answer questions #11-14. For question #15 (aka “the million dollar question”), contestants get 45 seconds plus the time left over from the other questions combined. Nearly every question falls into one of the following categories: art, literature, history, politics, science, film, geography, sports and current events. Popular culture, nursery rhymes and advertising slogans are also recurring themes. The audience provides the correct answer 94% of the time. The 50-50 always leaves you with the “best” wrong answer, and the right answer, so don’t waste it if there are 2 obvious choices. If you have a really hard question and you’re not sure if one of your friends to call can answer it, use your 50-50 before calling. That will make it easier for your friend, who has very little time to ponder the choices. The letter D has never been the correct answer for any of the million-dollar winners’ 15th question (aka “the million-dollar question”). The first 3 answers are never D (the last of the 4 choices). Instead, D is always used as a silly answer to lighten the tone of the show. Therefore, watch for D to be the proper response for the 4th or 5th questions. Sometimes the firsthand accounts of what the contestants have gone through are more revealing than the “facts”. The game show Wheel of Fortune debuted in 1975 with host Chuck Woolery. Vanna White has been the co-host and puzzle-board turner on Wheel of Fortune since 1982. In 1983, Wheel of Fortune was sold to a very small cross-section of markets as a syndicated night time show. Larger affiliates were concerned that the show wouldn’t work well as evening programming, but they were very wrong. Ratings were impressive, and it was picked up nationally in 1984. The show’s original letter board was retired in 1997, making Vanna White a letter-tapper rather than a letter-turner. The puzzleboard contains 52 touch screen monitors: 12 across in the top and bottom rows and 14 across in the two middle rows. The show’s producers conduct 1 or 2 contestant searches per month. Each year, over 10,000 people try out, but fewer than 600 people are selected to appear on the show. Contestants are responsible for all expenses incurred in connection with their audition and taping of the show in Los Angeles (or another city). The wheel weighs 4000 pounds. If the category is a plural, then there’s a 90% chance there’s at least one S in the puzzle. (Not all plurals end with S.) TIP: If there’s no “&”, call the N, and D, and then buy the A. The final puzzle free letters are R-S-T-L-N-E because those are the most popular letters used in words. The next most popular letter frequencies are: H-D-U-C-M. The final puzzle word always uses unusual letters, so don’t pick the most common ones. Pick rarer letters like k,j,and w, or base your choices on the next most popular letter frequencies, mentioned above. You can only be a contestant once in your life. Wheel of Fortune is the longest-running syndicated game show in U.S. television history. Vanna White caps more than anyone else on TV — an average of 720 claps per episode! The game show Jeopardy debuted in 1964. In addition to on-site auditions, Jeopardy also conducts online screenings for potential contestants. Jeopardy only allows you to audition once each year. If you miss more than 15 questions, then you’ve got to wait another 12 months before you can try again. About 15% of those who take the Jeopardy audition test pass it. Jeopardy gets tens of thousands of applicants every year for just 400 spots. Mathematically, getting into Harvard or Yale is about 8 times more likely than getting on Jeopardy! They don’t pay for any of your expenses (including travel or hotel) for being on the show which is filmed near Los Angeles, California. Ken Jennings won 74 consecutive games from June 2 through November 30, 2004 and amassed a total of $2,520,700 — breaking several records for both Jeopardy and American game shows in general. From 1984 to 1990, contestants’ winnings were capped at $75,000. Any money earned over that amount was donated to a charity chosen by the winner. The cap was eventually raised, and then eliminated altogether. 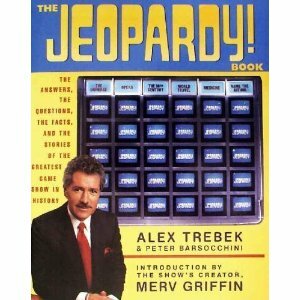 Alex Trebek has been the host of Jeopardy since 1984. To win on Jeopardy, it helps if you can read the question faster than Alex Trebek speaks it out loud. Also, press the buzzer after Alex finishes speaking, not after a light goes on. Then, keep pressing it. In terms of material, there are a few things you absolutely must know. These are, in order of importance: State and world capitals; U.S. presidents (order, years of office, and biographies); state nicknames; and Shakespeare’s plays, including basic plot lines and major characters. Trivia books do contain valuable material, but you have to search for it amidst a lot of unimportant stuff. The best single book I have seen is a little paperback called On the Tip of Your Tongue by Irene M. Franck. It contains an astonishing amount of relevant material. It’s no longer in print, but if you can find it, get it. (Another excellent one, much newer, is The Cultural Literacy Trivia Guide by Steven Ferrill. It’s actually written for people studying for shows like Jeopardy.) Pocket encyclopedias are also valuable and are easy to read cover to cover. If you’re going to cram for Jeopardy and seek one book to read, try the World Almanac. Just look for important stuff, like the presidents’ biographies. Get to know your fellow contestants, especially what they do for a living. That’ll help you on the show. Because if you are competing with a nurse and one of the categories is medicine, you’d do best to stay away from that category if you’ve got control of the board. Only the game winner gets to keep his or her money. The person in second place gets $2,000 and the person in third gets $1,000. And everyone on the show also gets a Jeopardy CD-ROM game. Yes, a contestant can win with only $1. It has happened before. The Final Jeopardy music is a tune called “Time for Tony,” written by Merv Griffin as a lullaby for his son. It serves as a reminder that time is running out. It was tweaked and renamed “Think!” Griffin estimated that royalties from the theme song earned him roughly $70 million. The game show The Price Is Right debuted in 1956, hosted by Bill Cullen. In 1972 the daytime game show became The New Price Is Right, hosted by Bob Barker. During his tenure, BoB Barker only missed one tape day of The Price Is Right’s daytime version. It was in the mid-1970’s. Drew Carey has been the host of The Price Is Right since 2007. The Price Is Right is the longest running 5-days-a-week game show in the world. When Bob Barker was the host, every person who attended a taping received a postcard with Bob Barker’s picture on it. The printed text on the back told your friends to watch you on the show. You wrote in the airdate (which you were informed of before the taping began) and dropped it in the mailbox outside in the lobby of Studio 33. The Price Is Right paid the postage! Tickets are FREE to be in the audience and potentially become a contestant. (Contestants are recruited right from the studio audience… “Come on down!“) Keep in mind, they issue more tickets than they have seats — so make sure you arrive early! You are eligible to be a contestant if you are 18 years of age or older and have not been on The Price Is Right in over 10 years (or any other game show within the past year). The show tapes in Los Angeles, California. Only 9 contestants are selected from the 325 audience members for each episode. Of those 9 contestants, only 6 will make it past Contestant’s Row and get to play the game. 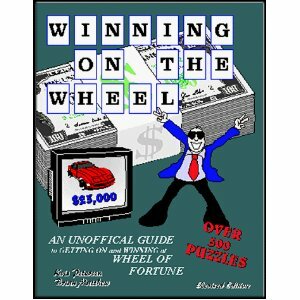 Cars get shown more often during the course of a game than other prizes do because the show gets paid a flat fee every time the car appears on viewers’ screens. The original Showcase Showdown wheel was spun “sideways” rather than “forward” and there was no $1000 bonus, nor a bonus spin. Today, the wheel contains 20 sections showing values from 5¢ to$1, in increments of 5 cents. Before she turned letters on Wheel Of Fortune, Vanna White “Came On Down” as a contestant on The Price Is Right. At the time (1980), she was a struggling model. She failed to make it up on stage.